all above board, (sea level) with a spectacular sunset that feels like it is yours alone. 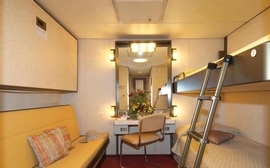 Each cabin is fully air-conditioned, and personalized with a bath or shower, direct-dial telephone, LCD television, personal safe, and wardrobe. You can settle in with a movie or instead simply watch the waters glide by. You can even order room-service in your cabin. 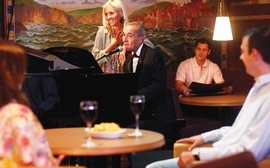 The ultimate in cruise accommodation, The cruise ship Salamis Filoxenia also offers 3 different Suite types with spacious rooms and living areas which are stylish, prestigious and classic. 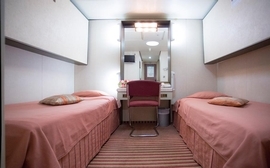 The different suite types include a living room with seating area, a separate dining area, twin beds or a queen-sized bed, full-sized bath, wardrobe with personal safe, vanity table with hair dryer and writing desk. The ship's safety and the well-being of our guests onboard are of utmost importance to the staff and crew of C/S Salamis Filoxenia. We never lose sight of the importance of our roles as ambassadors to our guests, and our well-trained staff enjoy interacting with you, to ensure your vacation with us is simply unforgettable! 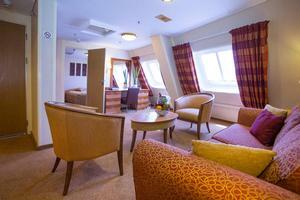 Category A cabins are located on deck 3 inside and are approximately 13 m2. 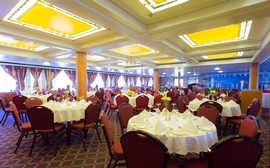 Category B cabins are located on deck 4 inside and are approximately 12.5 m2. 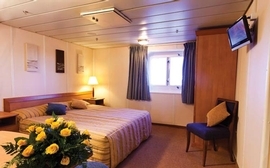 They feature 2 beds and 3rd/4th berth, shower & W.C. flat-panel satellite TV, safe, writing desk and phone, daily housekeeping and evening bed turn-down service. Category C cabins are located on deck 5 inside and range between 11 to 15 m2. 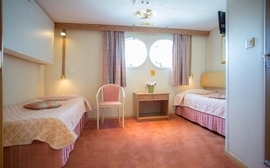 They feature 2 beds and 3rd/4th berth, shower & W.C. Flat-panel satellite TV, safe, writing desk and phone, daily housekeeping and evening bed turn-down service. 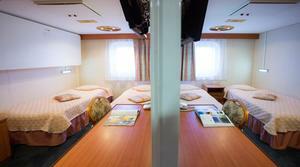 Category D cabins are located on decks 4 and 5 outside and range between 10 and 12 m2. They feature double a bed, shower & W.C. Flat-panel satellite TV, safe, phone, daily housekeeping and evening bed turn-down service. 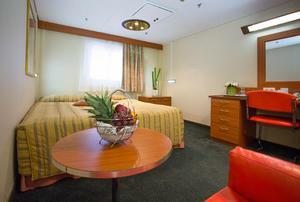 satellite TV, safe, writing desk, phone, daily housekeeping and evening bed turn-down service. Category G cabins are located on decks 7 and 8 outside and range between 14 and 16 m2. They feature 2 beds or 3 berths or a double bed, shower & W.C.
Flat-panel satellite TV, safe, writing desk, phone, daily housekeeping and evening bed turn-down service. double sofa bed, bath or Shower & W.C. Refrigerator, mini-bar set-up, flat- panel satellite TV, hairdryer, safe, writing desk and phone, bathrobe and slippers, daily housekeeping and evening bed turn-down service. 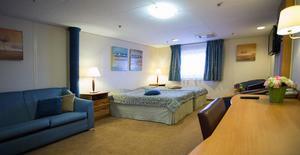 Category I Junior Suites are located on deck 7 and are a generous 27 m2. They feature 2 beds and sitting area with double sofa bed, bathtub & W.C. Refrigerator with basic complimentary mini-bar set-up, 32 inch flat-panel satellite TV, hairdryer, safe, writing desk and phone, bathrobe and slippers, daily housekeeping and evening bed turn-down service. 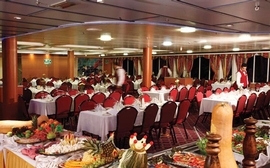 Category J Suites are located on deck 7 and 8 outside and are range between 30 – 40 m2. They feature a double bed and separate sitting room with double sofa bed, bathtub & W.C. Refrigerator with basic complimentary mini-bar set-up, 32inch flat-panel satellite TV, hairdryer, safe, writing desk and phone, bathrobe and slippers, daily housekeeping and evening bed turn-down service. 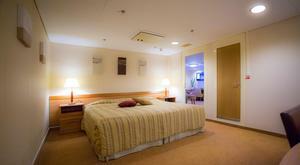 Category K Grand Suites are located on decks 7 and 8 outside and range between 47 – 48 m2. They feature a double bed, separate sitting room with double sofa bed, bathtub & W.C. Refrigerator with basic complimentary mini-bar set-up, 32 inch flat-panel satellite TV, hairdryer, safe, writing desk and phone, bathrobe and slippers, daily housekeeping and evening bed turn-down service.